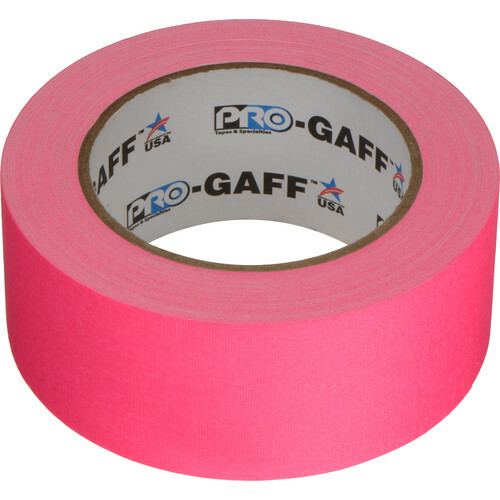 This 2" x 25 yd roll of fluorescent pink Pro Gaff Adhesive Tape from ProTapes is a matte cotton cloth tape with a synthetic rubber-based adhesive. It features a high-visibility fluorescent color ideal for marking areas, can be easily torn by hand, and is weather resistant. It is useful in a wide variety of applications and is highly conformable. The tape features a thickness of 11 mil, a tensile strength of 50 lb/in, a temperature range from 50 to 200°F, an elongation of 5%, and an adhesion to steel of 80 oz/in. Additionally, it is made in the USA. Box Dimensions (LxWxH) 4.8 x 4.8 x 1.9"
Pro Gaff Adhesive Tape (2" x 25 yd, Fluorescent Pink) is rated 5.0 out of 5 by 6. Rated 5 out of 5 by Nathan from It's tape Does a great job at holding cords to the ground without leaving sticky residue. Also good for taping up v-flats, keeping dumb 3rd assistant's mouths shut and a bunch of other stuff. And it's bright. Rated 5 out of 5 by Jenn from Pink is the only way to go Yep, it's gaff. Looks like gaff, smells like gaff, feels like gaff. But it's pink like PINK. PIIIINK. Best think ever. Rated 5 out of 5 by Brooklyn videographer from As advertised Great gaffe tape that's useful for making my black video equipment and any suspended wires standout in crowded spaces. Are all the Fluorescent color tapes reactive to UV Blacklight? Asked by: Jared & Marchielyn H.
Yes, the fluorescent ProTapes Pro Gaff Adhesive Tape should react to UV black lights. will it work as chroma key green? This is probably more of a digi-green, because it's quite saturated and bright. Which makes it a good color for keying, but if you need it to match green rags you've bought, you should not assume it will be the same color, and should test. If you had a greenscreen this color, it would be good for most greenscreen situations.